This is the Best of the Gold Country multi-Day adventure package – and this unique trip accommodates only forty lucky participants on weekends this summer. So make sure you call to book your preferred weekend soon! The Gorge run is the West Coast’s most popular river trip for good reason. 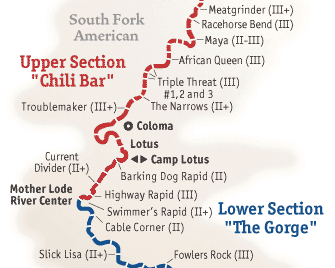 Featuring a leisurely start time (arrive at 11:30 am versus 8 am for Chili Bar), this run builds gradually from playful Class 2 to exciting Class 3 rapids in a fitting crescendo of thrills before you reach Folsom Reservoir. Another advantage of the Gorge is Mother Lode’s location. As the most downstream camp, we can put on the river after all the other companies. 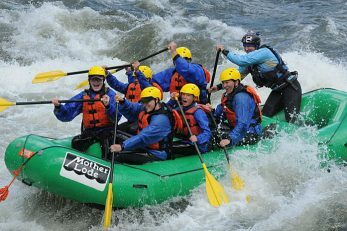 Not only do we enjoy more rapids per mile, we avoid the crowds, even on busy days! All these advantages make for a great trip. We have lots of time to play and cavort on the water before we shuttle back to camp to get settled, clean up, enjoy a hot shower, and savor a delicious home cooked dinner. As the campfire camaraderie begins, prepare to swap stories before retiring to the comfort of our spacious tent cabins to end the perfect day! But could it get even better? Absolutely! The next morning we awaken to the smell of coffee and enjoy a hearty breakfast before we take on the excitement of our new zip line combined with other high elements of the high ropes course. You will be finished at roughly noon Sunday. This is the Best of the Gold Country and this unique trip will be offered throughout the summer. We expect spaces to fill up quickly, so make sure you call to book your preferred weekend soon! Looking for maximum privacy or more luxury? Check out our Accommodations page for more options. 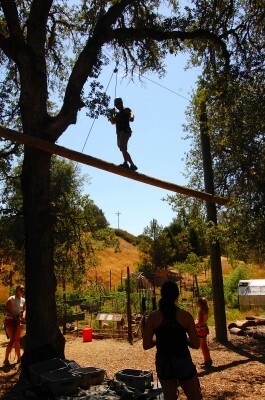 Our Zip Line and High Ropes Course include elements that challenge the individual like the leap of faith, climbing wall, and the elevated balance beam. Although these elements are done one person at a time, your encouragement and support from the ground will help your friends as they push their limits above. The course also features the pipe dream, an element that requires teamwork to succeed. And of course, our new expanded zip line will send you soaring through the trees, giving give you a rush and a gorgeous view. 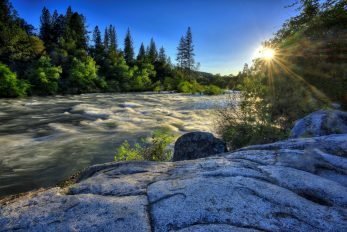 The Gorge run on the South Fork of the American River begins right at our camp. At the beginning of the trip your guide will instruct you on how to paddle and you’ll have some class II rapids to practice on. Once you’re inside the Gorge proper you’ll be ready for the larger, more exciting class III rapids like Satan’s Cesspool and Hospital Bar, just to name a few. Mother Lode River Center is mere minutes away from the Marshall Gold Discovery State Historic Park where gold was first discovered in California in 1848. We like to remember the historical roots of our local community and share that with as many people as we can. Following dinner in the evening, there will be a campfire where we can swap stories of our adventures on the water. Optional Upgrades: Looking for maximum privacy or more luxury? 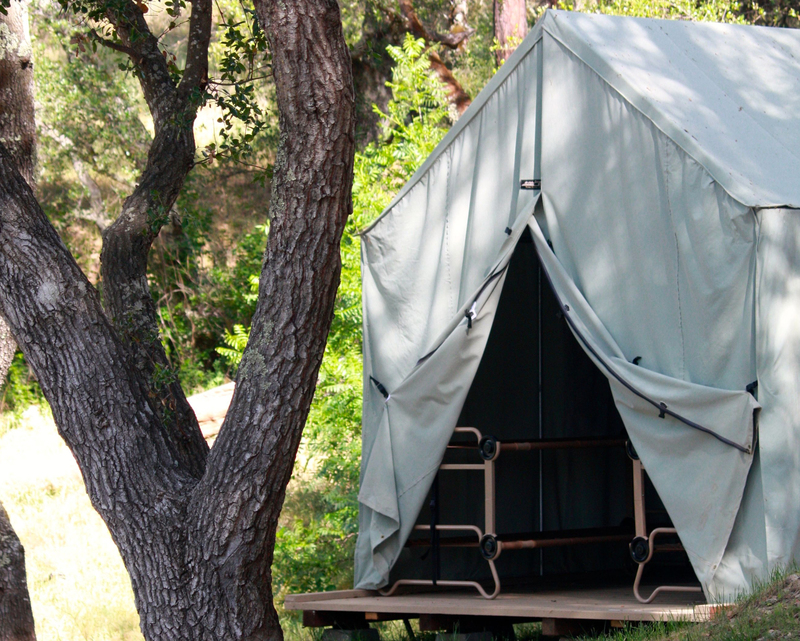 Check out our Accommodations page for more options : Our “Glamour” camping tents that are located in a secluded area of the camp – with beds and furniture! The Cozy River Cottage has its own bathroom and kitchen and sleeps 4 guests The luxurious two bedroom/two bath Eco-Retreat House (two night minimum) is available to large groups who are renting the Retreat Center as a venue for a private event. There are options to suit every need! Minimum Age: 8 years old. Subject to change based on river conditions. Rafting Requirements: All guests must have swimming ability. Check out the South Fork Rapids!